A senior member of the Jedi Council, Mace Windu leads a battalion to the red rock planet of Geonosis in an attempt to rescue Anakin Skywalker, Obi-Wan Kenobi, and Padm� Amidala. 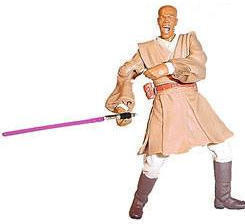 This 3.75-inch-tall action figure features awesome Force action: hold Mace's left hand over his lightsaber and the weapon is Force-attracted to his hand by a magnet. The 3.75-inch-tall droid comes apart when hit by the Force blast.